After eight years as governor of New Jersey, Chris Christie delivered his final State of the State address on Tuesday. TRENTON — In a speech that was boastful and reminiscent, Gov. Chris Christie delivered his final State of the State address on Tuesday, capping a tumultuous eight-year tenure as the Republican governor of New Jersey marked by soaring highs, brought by reforms and a tough-talking style, and historic lows, from scandal and a failed presidential bid. In a nearly 90-minute address, the governor, who has the lowest approval rating in New Jersey’s history, spun a rosy tale of a state he rescued from financial travails, citing a tally of accomplishments seemingly at odds with his constituents’ current view of him. He followed with a relentless defense of his record, mixing his blunt speaking style with a ledger of figures, percentages and rates, trumpeting his successes while glossing over his shortcomings. He pointed to what he portrayed as the recovery of Atlantic City, which has been troubled by a struggling casino industry, and Camden, which has been plagued by crime and saddled with poor schools. “This, all of this, is due to our efforts, not bowing to political correctness, not worrying about being loved today,” Mr. Christie said. Laced throughout his speech were warnings, delivered in the brash manner that defined his two terms, to his successor, Philip D. Murphy, a Democrat, about not bowing to special interests that would undermine the state’s progress. And while he made his case, Mr. Christie did gloss over some numbers. Though he did cut the unemployment rate in half, New Jersey’s rate of 4.9 percent is still higher than the national average of 4.1 percent. And when he talked about a newly replenished state fund used to pay for public transit and road projects, he did not mention how close it came to bankruptcy, how New Jersey Transit service has declined or how he canceled a proposed rail tunnel under the Hudson River. He paused in listing his accomplishments to thank political partners by name, including Democrats like Dana Redd, the former mayor of Camden, and Stephen M. Sweeney, the Senate president with whom Mr. Christie negotiated many deals. Sitting in the front row was one of those governors, James E. McGreevey. He did not join in the standing ovation that followed that line. Mr. Christie saved his strongest superlatives for his administration’s response to Hurricane Sandy, the 2012 disaster that launched his approval ratings into the stratosphere and elevated his national stature. Mr. Christie, who was still tinkering with his speech hours before he was set to deliver it, routinely paused to take in the applause. For a governor who has been roundly disparaged by voters in New Jersey and political pundits across the country, he seemed to take extra joy in the support from lawmakers. The incoming governor, Mr. Murphy, did not attend the speech, though he was spotted posing for pictures with attendees less than an hour before Mr. Christie was scheduled to step up to the lectern. “Just passing through,” he said to those circling around him. When asked whether he would stick around, the governor-elect said he could not. 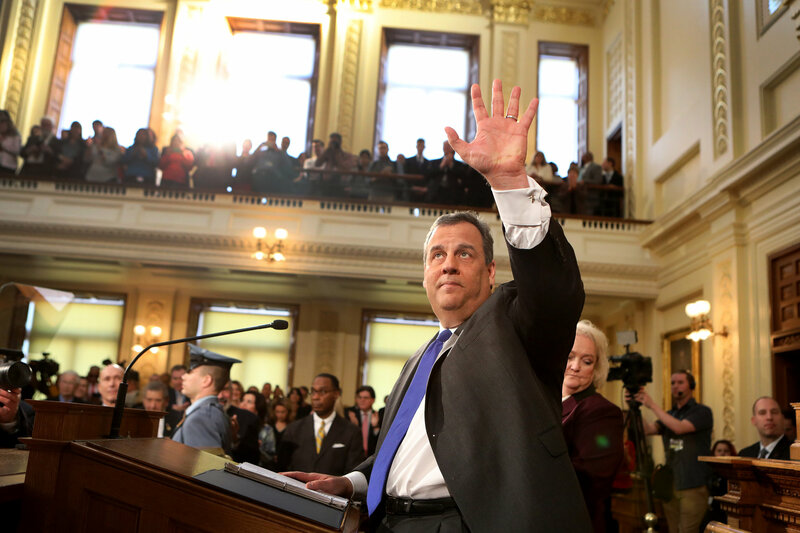 But for Mr. Christie, it was the final time he would grip the ornate wooden lectern under the giant golden arch in the packed Assembly chamber, lean forward forcefully on his right elbow and proclaim the world as he sees it.